Could LeBron Really End Up Playing for the Golden State Warriors? According to ESPN’s Chris Haynes, there is a scenario where the Golden Warriors could clear enough cap space to land LeBron James and it appears that he would listen. 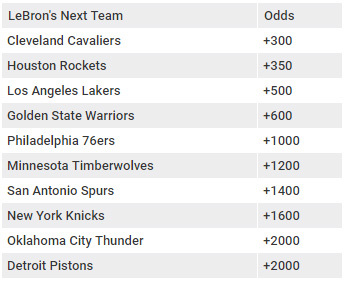 Whether this will actually happen is nothing more than speculation at this time, but that didn’t prevent oddsmakers from posting odds regarding which team LeBron will play for next season. Despite the drama in Cleveland, a return to the Cavs is the most likely outcome, but not by much. Joining James Harden and Chris Paul in Houston is next at +350, while becoming a Big Baller in Los Angeles falls at +500. Golden State (+600) ranks as the 4th-most likely option and a scary one for the rest of the NBA considering Steph Curry would be universally regarded as “only” the third-best player on that team.